The AirLink GX450 is a rugged secure mobile gateway designed to deliver mission-critical communications for in-vehicle applications. The GX450 is an update to the popular GX440 platform. The GX450 features product enhancements including support for Verizon XLTE faster boot time of less than 1 minute carrier switching (available in a future firmware update) and larger storage of up to 2 Gigabyte. The GX450 family of 4G XLTE intelligent gateway modems provides a flexible device with multiple interfaces reliable cellular connectivity and a built-in expansion slot to provide scalability required for today's applications. 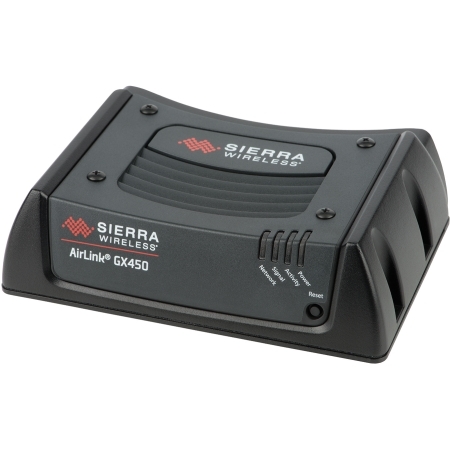 The GX450 is compact has a rugged design and an advanced GPS which makes this cellular modem a powerful solution at an affordable price. Designed for versatility with embedded intelligence; the AirLink GX450 offers many configurations and has a variety of interfaces to for use in a wide range of solutions. Applications include transportation industrial machine-to-machine (M2M) and enterprise deployments. Optional AC-12VDC power adapter (sku: 522713).AirLink management service can be added to enable hosted services where you can manage firmware embedded applications and airtime subscriptions remotely (sku: 515382). An additional 2 years of warranty can be added at time of purchase by using (sku: 508525).